FALL RIVER — On Tuesday of Holy Week, Bishop Edgar M. da Cunha, S.D.V., joined by priests of the Diocese, will celebrate the annual Chrism Mass at St. Mary’s Cathedral – a celebration that includes the blessing of oils and the renewing of priestly promises. It will take place at 4 p.m. on Tuesday, April 16, and all are invited to attend. Oil is an ancient symbol of strengthening, healing and preparation and, following the homily in the Mass, Bishop da Cunha will bless the three oils to be used in the sacramental life of the Diocese during the year. The Oil of the Sick and the Oil of the Catechumens consist of an olive oil and are blessed in the same way holy water is blessed. The Oil of the Sick is used for the anointing of all who are ill and in need of God’s healing; the Oil of the Catechumens is used for the anointing of infants, children and adults who are preparing for baptism. The Mass takes its name from the third oil, the Sacred Chrism, the most eminent of the three. It is olive oil mixed with balsam, and it will be consecrated by the bishop during the Mass. 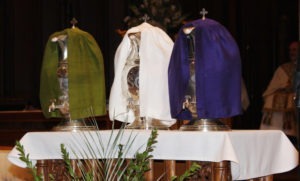 The bishop will breathe on the oil, which is symbolic of the Holy Spirit. Sacred Chrism is used in baptisms, confirmations, ordinations, and the dedication and blessing of churches and altars. 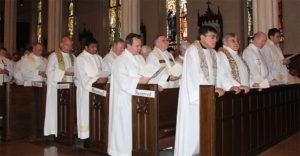 The Chrism Mass is also a time for priests in the presence of the bishop and the faithful to renew their commitment to the ministry to which they were ordained. Bishop da Cunha will then ask the lay faithful present at the Mass to pray for their priests as well as for him in his service as diocesan bishop. After the Mass, the oils are distributed to all parishes in the Diocese for their use throughout the year. St. Mary’s Cathedral is located at 327 Second Street at the corner of Spring Street in Fall River.